Aquatic therapy is wonderful, but it is not for everyone. 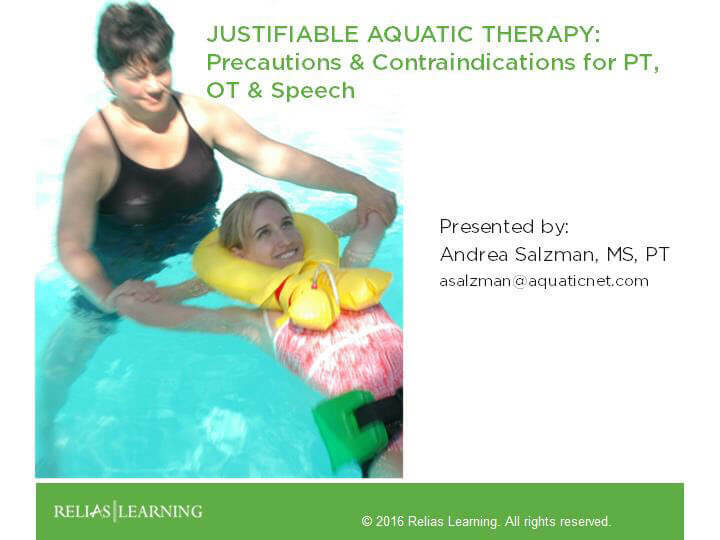 So how should PT, OT & SLP providers make the choice whether to take patients into the pool or not? Sadly, many therapeutic pools across the country have established their own unique (and contradictory) lists of which conditions should be “forbidden” from the pool. Many such lists are based on outdated information or evidence. This course will guide the learner through a comprehensive look at how individual facilities should determine which conditions should be precautions (left to the discretion of the therapist) and which should be actual contraindications. Finally, the learner will have a better understanding of how to make case-by-case judgements on patients with precautionary conditions. NOTE: While not all disciplines will treat all conditions discussed during this course as a primary diagnosis, each provider must have a satisfactory knowledge of comorbidities that are considered precautionary or contraindicated. E.g. The SLP should have a reasonable understanding of whether it is safe to take a patient with a recent stroke into the water for speech services when that patient has non-speech-related comorbidities such as a recent total hip, incontinence, or rheumatoid arthritis. The purpose of this activity is to enable the learner to determine which conditions should be considered precautionary for aquatic therapy and which should be frank contraindications (forbidden). Additionally, this course will empower the learner to make better decisions on whether or not to permit any given patient to participate in aquatic therapy. Finally, this course will teach providers to problem-solve whether or not a patient’s comorbidities should prevent immersion. Disclosures: Andrea Salzman MS, PT has no relevant financial or nonfinancial relationships to disclose. Explain at least 1 reason is it important to maintain a very short contraindications list and a very long precautions list in the aquatic therapy setting. Describe 3 conditions under which it is important to seek additional orders from the referring provider. Generate an evidence-based contraindications list containing at least 5 contraindications for use in an aquatic setting. The target audience for this course is: entry level Occupational Therapists; entry level Physical Therapists; entry level Speech and Language Pathologists; in the following settings: Rehabilitation Settings.